Social identity is an odd thing. I could get into the details of how fluid a thing it is, but instead I would like to address a specific aspect of identity: social status. In the tradition of social anthropology, there are two distinct types of social statuses—ascribed and achieved. An ascribed status is one we are born with: race, ethnicity, and gender are some examples of such (this is a generalized statement, when decolonizing anthropology, ascribed statuses are NOT an essential part of a person’s identity). An achieved status is precisely as it sounds, the sort of status that can be achieved during one’s lifetime: doctor, high school graduate, dog-owner. 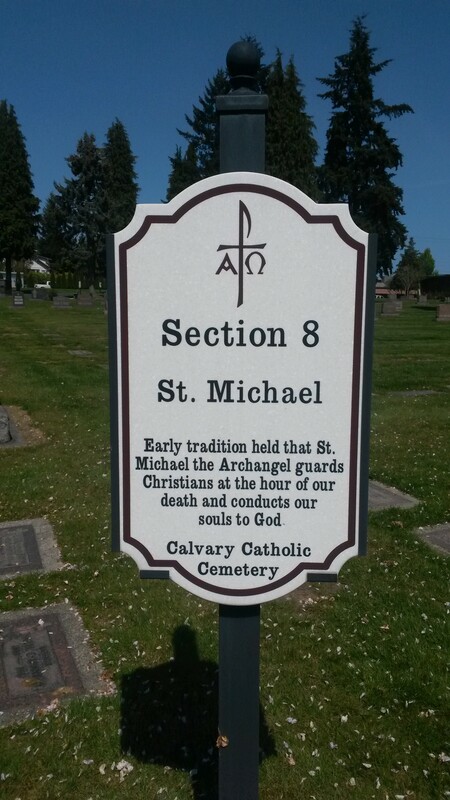 From looking at the data collected from the Calvary Cemetery in Seattle, there are some very interesting things to note about the titles granted to the deceased after their death. Women, buried in this particular cemetery, are far more likely to be identified with ascribed statuses: sister, daughter. There is a fair share of achieved statuses as well, but many of them are mother and wife; domestic-based titles that pair their identity with other people, particularly with a male in their lives. Men’s titles, while not all achieved (there’s a fair amount of brothers and fathers), the larger percentage are identified as doctors or with military ranks. Their identities are independent of anyone else (and certainly not dependent on a woman to create their identities). 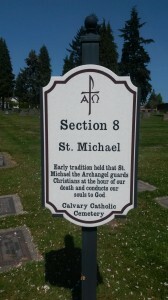 All of these are identities that were chosen for the deceased by those who were left behind, generally grave markers are chosen for a person after they have already died. Nearly all of them, even the achieved statuses like doctor and military ranks, while perhaps not dependent on other people, are about relationships, especially with those who are left behind. The only time I feel comfortable in large groups of people is when most of them are dead. A couple weeks ago, as I milled through Calvary Cemetery, noting births and deaths, epitaphs and adornments, I reflected on how lucky I was to be doing my favorite kind of activity in my favorite kind of place, and to be getting academic credit for it. 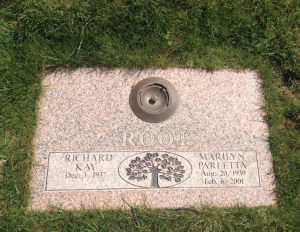 Reading the various grave-markers, I made up stories about the lives of all the people interred beneath me; their relationships to one another, how far away their place of birth was from their place of death, and particularly, how did they die? I don’t think anyone can stroll between hundreds of gravestones without wondering how their owners died. For this reason, I focused on death frequencies as I analysed the data collected by myself and my peers at Calvary. The first thing I looked at was the general death frequencies by year. There are two distinct peaks: one around 1940, and the other within the last five years. Now, I am a bit skeptical as to how meaningful any of the data examined and presented here is meaningful, due to the extremely small sample size. 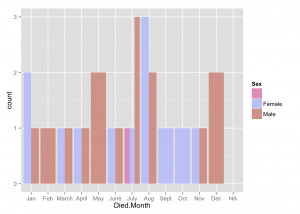 However, another reason I chose to focus on death frequency, was that, although there may have been a selection bias that effected which stones were recorded, the actual dates themselves are reasonably objective. By this I mean that the criteria for what is recorded as “1945” by me is the same criteria that made a colleague record “1945”: the gravestone says the individual whose death it marks died in 1945. Because of this, I feel comfortable making a prediction about the cause of these two spikes in the data, and this prediction is (you guessed it) war. 1940, as we all know, is the beginning of US involvement in World War II. Thousands of soldiers were shipped off, and thousands of soldiers died. I would not be remotely surprised if the cause of the Calvary spike around this period is somehow related to this war. Now my suggestion for the most recent spike is also related to the war, though perhaps a little further removed: the Baby Boomers are dying. The average lifespan of an adult male is somewhere around 70 years old. After the war, when all those spry sweethearts hopped into the post-war bed they popped out a bunch of babes. Well, these babes are now reaching their seventies, and, statistically, it’s about their time to pop back off. As I’ve mentioned before, this study came packed with bias and oozing inadequate sample size. I am very curious to see if, upon more detailed and further analysis, these same frequencies would hold true. If they don’t then perhaps they reflect that the areas of the cemetery that we examined were simply utilized the most during the peak time periods because of spatial or organizational issues. 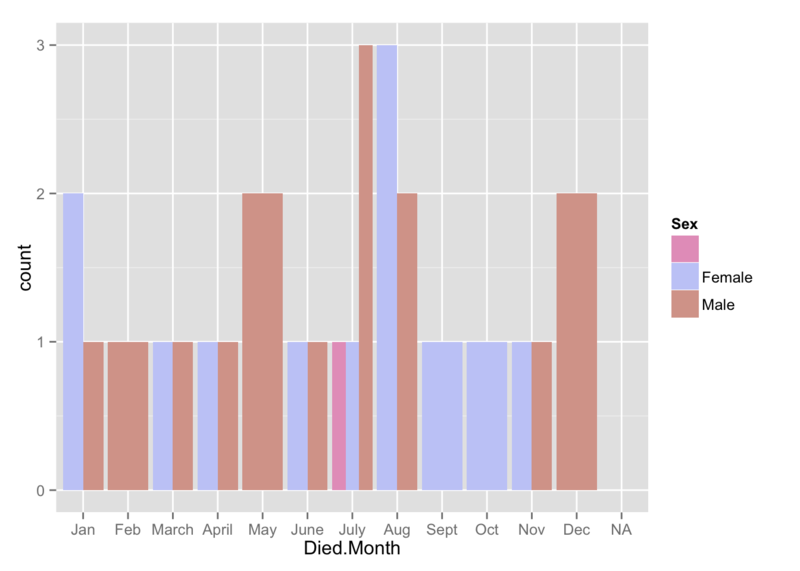 Just for fun, I also looked at the months in which people in the cemetery died and, surprisingly, found that most deaths in our data of both men and women occurred between July-August. My only hypothesis for this is extremely unscientific: perhaps, after the cold Seattle winter, perhaps they just couldn’t take the heat. While examining the aggregate class data from our trip to Calvary Cemetery, I feel that in some ways I found less than expected and yet more than hoped. Not that I knew exactly what I would find during my walk around the cemetery. Differences correlated with gender were of immediate interest to me, though in hindsight I feel that I may have been trying too hard to locate such differences where they might not have occurred or been meaningful. A larger sample per section and consequently a larger overall sample would have provided a better basis for determining if such differences occurred and were indeed significant. Nevertheless, I would not be deterred! 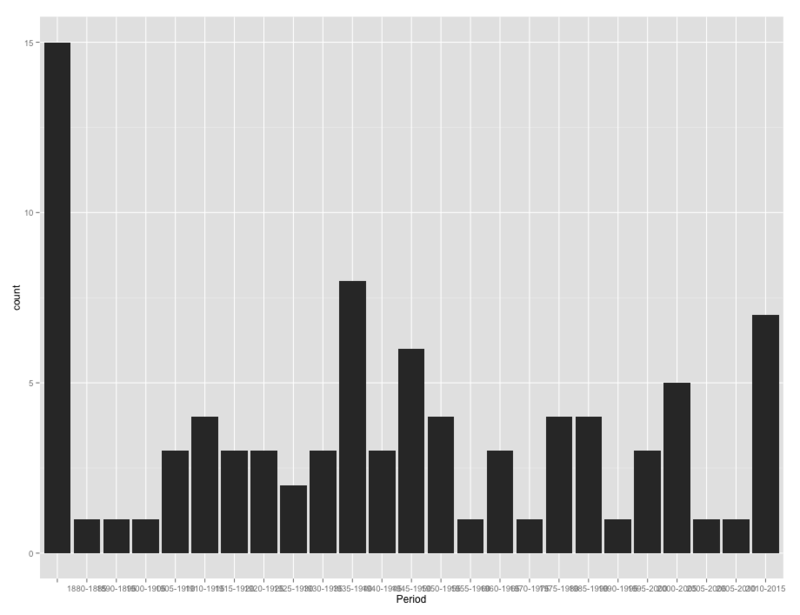 I found that a few of the trends I extracted from the data may yet provide insights. 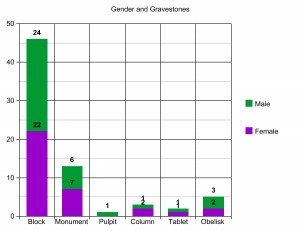 Overall, women’s graves tended to demonstrate strong associations with religion and religious institutions. 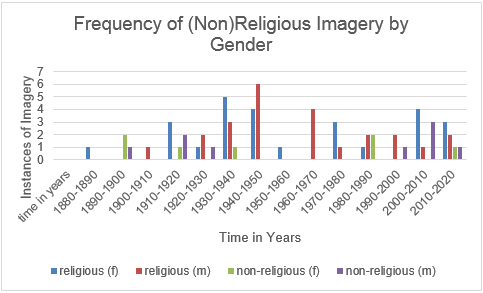 By contrast, men’s graves begin to shift from religious representation to non-religious, sometimes occupational, representations toward the end of the 19th century. 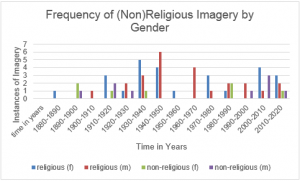 This at first stood out to me as a trend indicative of a tendency to highlight women’s religious affiliations at the expense of their other, possibly occupational, attributes. However, as recent class discussions have advised: we cannot ignore the potential for agency. 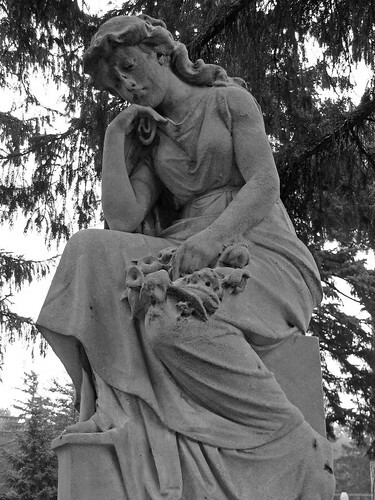 It is likely that those interred in Calvary Cemetery, women included, had a say in how they are presented, and remembered, in death. Thus, it is possible that women themselves chose to represent themselves and their religious affiliations in such a way. That is not to say that such a choice was made outside a larger sociocultural context, but it does speak to the potential for women’s active involvement in their own representation.